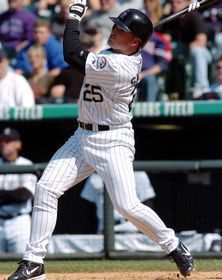 12-year ML veteran has established himself as valuable role player, while excelling as pinch-hitter...in fact, is tied with Dave Hansen for fifth all-time with 139 career pinch-hits...only players with more pinch-hits in ML history are Lenny Harris (212), Manny Mota (150) Smokey Burgess (145) and Greg Gross (143)...lifetime .265 hitter (139-for-525) off bench leads all active players in pinch hits, pinch-HRs (13) and pinch-RBI (88)...has produced in clutch situations during career, batting .282 (123-for-436) with RISP...originally ninth round pick of California Angels in 1991 draft, has played in 1,014 ML contests with St. Louis (1995-97), San Diego (1997-98, 2002 and 2005), Cincinnati (1999), Milwaukee (2000-01), Colorado (2003-04) and San Francisco (2006)...is one of five players in Padres history to have logged 3 stints with club. 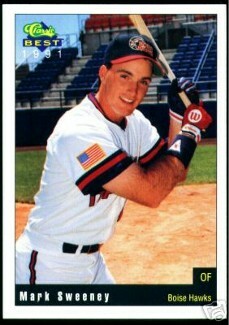 Graduated from Holliston (Mass) High School...was finalist for 1991 Golden Spikes Award, given annually to top player in collegiate baseball, as senior at University of Maine...batted .384 with 23 HRs, 80 RBI and 22 stolen bases in 65 games...graduated with business degree...single. Has compiled impressive postseason resume, batting .357 (5-for-14) with 2B and RBI in 17 career playoff contests...has made trio of trips to October stage, including World Series berth with Padres in 1998...went 2-for-3 against Yankees in Fall Classic...also advanced to postseason with St. Louis in 1996 and again with San Diego in 2005. Was community stalwart during first season with Giants, lending much of his time to good causes...was club's nominee for Hutch Award...award, which is named after former ML pitcher and manager Fred Hutchinson, is given annually to Major Leaguer who best exemplifies character, desire and fighting spirit...began year with trip to 2006 KNBR/Giants Winter FanFest, which included trip to visit patients at Shriners Hospital for Kids in Sacramento...served as Giants' spokesman throughout season for Greater Bay Area Make-AWish Foundation, welcoming "wish" kids from Foundation prior to every Tuesday home game at AT&T Park...lent his services to teach baseball skills clinic for children participating in Special Olympics...participated in pre-game ceremony congratulating winners of Gang Resistance Education and Training Program, sponsored by Bureau of Alcohol, Tobacco, Firearms and Explosives...co-chaired annual "Halloween Heroes" event put on by Wender Weis Foundation for Children, event benefiting Junior Giants Program.